Three-reel slots have become very popular recently so Rival Gaming has just come out with a new one, the glittering new Midas Touch. Slots Capital and Desert Nights are the first online casinos to have it. 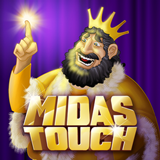 The new classic 3-reel slot Midas Touch is now available in the download and instant play casinos for desktop and laptop computers and in the mobile casino for smartphones and tablets. For a limited time, both casinos will triple your deposits to give you more Midas-time. Slots Capital and Desert Nights Casino tripling deposits to try new game from Rival Gaming. 40X rollover; no max cashout. As legend has it, when King Midas was granted a wish, he asked that anything he touched would turn to gold. In his case that wasn’t all good – but in the dazzling new Midas Touch real money online slot game, it’s great when everything becomes golden. Players can bet from one to three coins per line. Coins are valued from .01 to 5.00 each. The default bet is $2.25 -- three coins valued at $.25 each bet on each of the three lines. The maximum jackpot on a max bet (2000 $5 coins) is $10,000. Slots Capital Casino and Desert Nights Casino welcome players from all over the world, offering a huge selection of games from Rival Gaming that are available at only a few select online casinos.